Mind your X's and O's in this fireworks-filled strategy game. The last time we played Tic Tac Toe, it was on a piece of paper, a pen was involved and there's a good chance this took place more than 20 years ago. 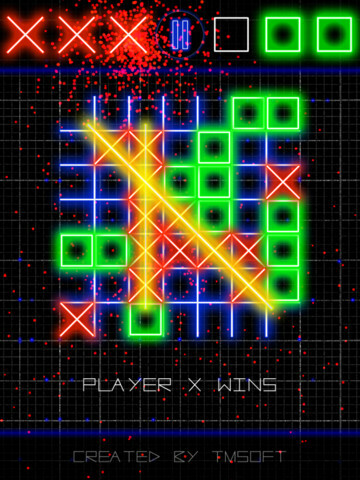 That said, there has to be something special about Tic Tac Toe Glow by TMSOFT to put this game on our iPhones and iPads. Turns out, it's the best Tic Tac Toe video game we've seen. Keep in mind that our experience with Tic Tac Toe games began and ended with 3D Tic-Tac-Toe for Atari 2600, circa 1980. So why's this iOS title so cool? Well, it plays a mean game of Tic Tac Toe, for starters. Not only can you enjoy the classic three-by-three grid that most people scribble into their notebooks and on paper napkins, but also five-by-five and seven-by-seven grids, the latter of which takes the concept of placing X's and O's to new extremes. On top of that, there's a snarky female announcer that might as well be the HAL 9000 of the Tic Tac To universe. Win, and she makes up some excuse. Lose, and she rubs it in your face. Take too long to respond, and she gets antsy. We half expect her to somehow jack into our heads and make our brains explode. In short, don't trust her. Not that she cheats, mind you. The A.I. is capable of pulling off some skilled moves, as far as Tic Tac Toe goes. Not on the easy difficulties, but once you reach level three and especially four, it may take several ties before it commits a costly mistake, and you better capitalize, lest you wind up running through another series of ties until one player cracks. Meanwhile, the game has cool neon graphics, along with fireworks explosions whenever a person or the computer wins. You're free to upload the images to social media, but come on. It's Tic Tac Toe. Calm yourself. 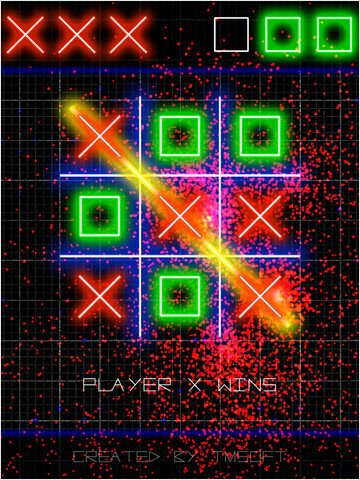 Throw in single-screen support for two players, and Tic Tac Toe Glow is a simple to grasp, fun and visually stimulating effort that'll keep you entertained for a little while. And if you have reservations about buying a game based on Tic Tac Toe, have no fear, because it's free. What's Hot: Three different Tic Tac Toe variants, sharp computer opponent, wisecracking A.I., slick neon graphics and fireworks, two-player support, free. What's Not: Not much content, easy difficulty is pathetically easy.